RBI's really not doing this well. Since Dec, I have been wondering why RBI doesn't use more hawkish language (while taking exactly the same actions). 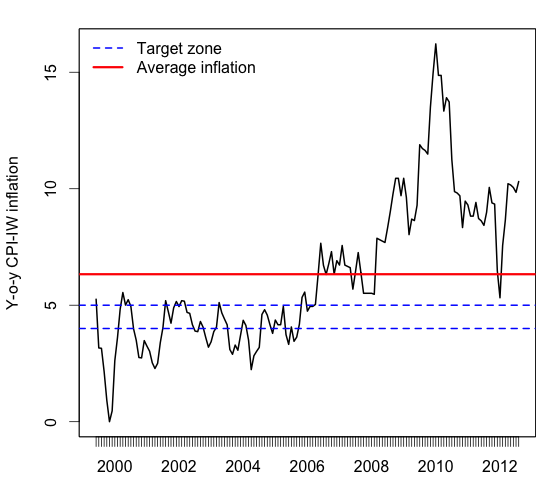 RBI's main function today is to manage inflation expectations. It has failed to convince the market that it is concerned about inflation enough. Every action is seen as the last in the series, and everyone starts expecting a rate cut the next time around. How in the world are inflation expectations going to come down with this kind of messaging? Back in Dec, they could have made it clear to the markets that they were serious about inflation. Maybe, now with some conflict between PC and RBI, inflation expectations might temper down. This could have been done last year. If I remember right, then as now, RBI was saying that inflation will come down in a quarter. This sort of messaging is counter-productive. That inflation chart is very interesting and I keep thinking about it from various different angles. The inflation chart seems like a 2-3 year lagged version of the stock boom, asset inflation, commodities boom (especially if you consider the ramp from 2004 to 2007). I wonder if the high inflation from 2008 to 2010 was the price to be paid for the asset inflation and runaway growth from 2004 to 2007? Was it something to be addressed in 2005-2007 and were we behind the curve already in 2008? Are there any well-known long lag relationships between asset inflation and inflation, between money/credit growth and inflation? Any comments on this would be appreciated.